#MYCyberSALE - the biggest ever online sale is set to hit Malaysia from 29 September to 1 October 2014, with over 225,000 online deals promising discounts up to 90% from over 4,500 merchants. #MYCyberSALE - the biggest ever online sale is set to hit Malaysia from 29 September to 1 October 2014, with over 225,000 online deals promising discounts up to 90% from over 4,500 merchants. There will be many attractive prizes to be won too. Before it is even started, we have seen some sneak peak to promotions by Groupon, Astro, GSC etc. 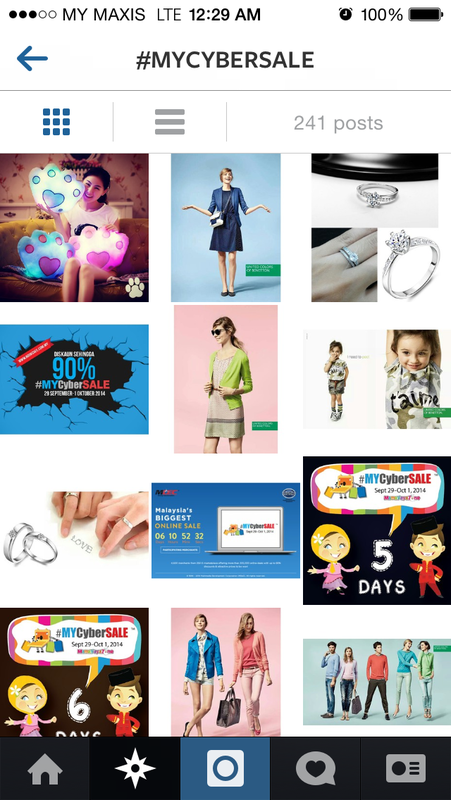 Besides bookmarking and getting ready to browse http://www.mycybersale.my, what other ways to follow #MYCyberSALE, to avoid great deals slipping through your fingers? 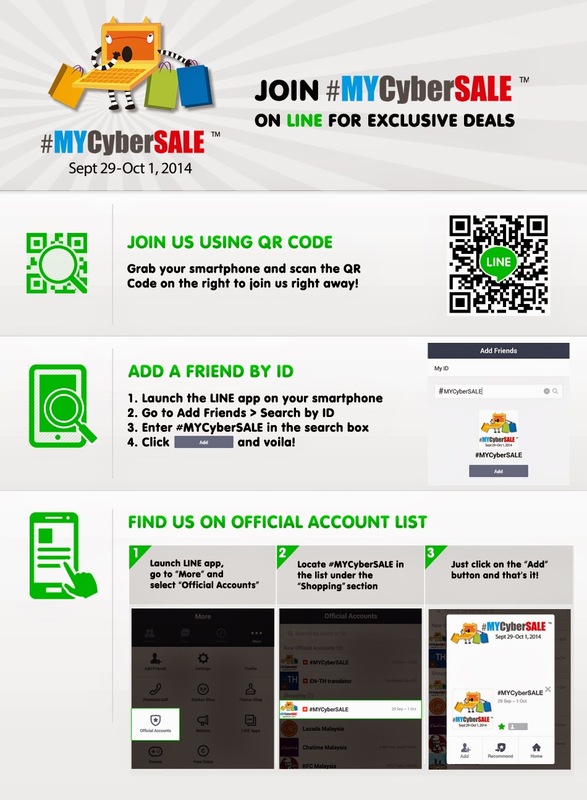 There is neither official Facebook (business page), nor Twitter, Instagram account for you to follow on #MYCyberSALE. The only official social media account dedicated to this nationwide online sale campaign is #MYCyberSALE LINE Official Account. Therefore it should be the first in your checklist to join #MYCyberSALE on LINE, and get exclusive deals delivered to your fingertips. As we are expecting over 225,000 online deals, not all deals will be promoted or covered by the official website or LINE account. Since most Malaysians use Facebook on mobile nowadays (refer mobile stats here), so we thought it would be nice if we show here how to follow the hashtag on your Facebook mobile app. Voila! You now get to follow #MYCyberSALE while you are Facebook-ing. 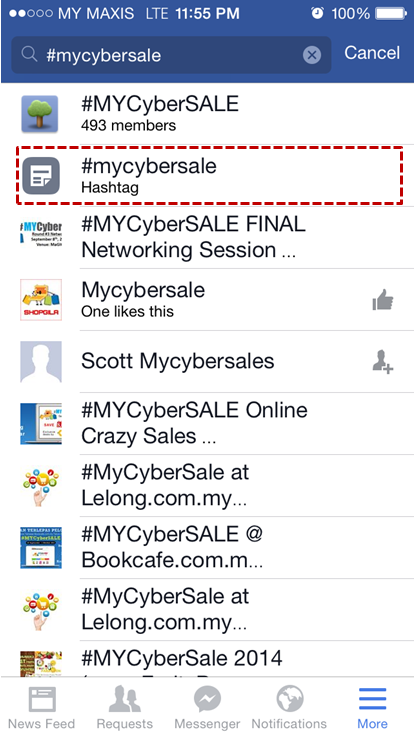 Similar with Facebook, deal hunters can also search for #MYCyberSALE hashtag on other social media platforms. Tech junkie might prefer using social media tools like HootSuite or Tweetdeck to follow #MYCyberSALE hashtag on Twitter. For visual animals, just search for "#mycybersale" hashtag on Instagram, and vibrant stuffs like the one shown below will be a pleasing to the eye. Having said that, all online merchants are advised to tag #MYCyberSALE in their posting on social media. Do share with us any other fun tips and tricks you can think of. On your mark, get set, happy deals hunting everyone!